WATERLOO – For the first time ever, over 150 Wilfrid Laurier University second-year students at the Lazaridis School of Business & Economics will compete in the IKEA Sustainability Challenge, a competition sponsored by IKEA Canada to find groundbreaking ideas to integrate sustainability with the IKEA brand. This is the first year for the partnership between IKEA Canada and the Lazaridis School of Business & Economics. 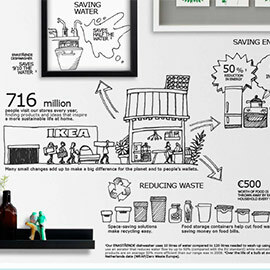 The competition will not only challenge students to investigate sustainability issues as an integral principle of business practices but will also inspire new ideas at IKEA. The competition challenges Bachelor of Business Administration (BBA) students to develop an idea that will help integrate sustainability into IKEA Canada’s brand and products. Recently, the students teamed up in teams of three to five, and submitted a proposal for judging in the first phase of the competition. The top-ranking teams were then invited to IKEA Burlington for a store tour and to pick up any items that would be useful in the presentation of their idea. On Nov. 23, the top teams will submit short videos demonstrating their ideas, which will be shared with sustainability influencers in the Waterloo Region and Greater Toronto Area, who will then select the top five teams to move on to the finals. The final presentations will be made to a panel of judges, including representatives from IKEA, on Friday, Nov. 27 from 2 p.m. to 4:30 p.m. on Laurier’s Waterloo campus in the Senate and Board Chamber. The winning team will have the opportunity to work with IKEA on their proposal and discuss their sustainability idea with senior executives at IKEA Canada. They will also be flown to an IKEA-owned wind farm and each team member will have an opportunity to interview for a co-op or internship position at IKEA Canada. The event is open to the media. Journalists specializing in business and sustainability are invited to be a part of the judging panel. Please RSVP to Richia McCutcheon at rmccutcheon@wlu.ca.